is also a military spouse to be my guest. I'm clever like that. The Fourth of July has always been more my husband's holiday. Me? I’ve never been a huge fan of fireworks, and having caught my coat on fire once as a child, it’s easy to see why. He has always loved to blow stuff up and the 4th is no exception. But the day is more than your average holiday, and way more than the one time a year that many areas legalize fireworks. Unlike other holidays that are more military centered, I find Independence Day to be EVERYONE’s holiday. It’s not a day for one group, or even one that I have strong opinions about usually. It’s a fabulous day of celebration and a day to honor the entire nation, all of us. The amazing country we know that accepts people as they are and let’s us live life free of persecution. The first amendment alone is a pretty phenomenal thing. Just think of how many countries out there don’t have the freedom of speech, let alone freedom of the press. That says a lot about how we feel things should be, and we should feel pretty lucky to be Americans, whether first generation or 100th. I get asked a lot, as a military spouse blogger, to write on or about Independence Day. I see why, as someone married to a service member, we as a group tend to have strong opinions and (sometimes) even louder voices. Goodness knows I’m no exception and have been lambasted in the past about things I’ve written when I’ve chosen to exercise my lungs a bit too heartily. The truth is, I think the 4th of July, unlike many other days of remembrance, is one that the whole nation can and should feel proud of and participate in. It’s not specific to those who served in the military, or a certain race or creed. It’s all-inclusive, without agenda or malice, and isn’t that really what our nation is about? Founded on the principles of freedom for all, free from persecution for beliefs and the rights of all who live here to be free and live life as they want, America is truly a blessing to live in. I know that much of this is simplifying things and, frankly, a bit naive, but the truth is, maybe we need more of that. No “freedom with a caveat,” not “free unless…” Just free. Just us, being free, free to pursue our life’s dreams. Free to be who we are. Sure the world has politics and loopholes. The government has good times and bad, and everyone, no matter what position they hold, can and has made mistakes. But sometimes it seems we spend so much time focusing on what could be better, should be better, wasn’t better, and isn’t better, that we forget to remember the amazing rights we have merely for living here. Simply for being here, on this land. Our Constitution and Bill of Rights were pretty amazing things when first written. We defied a King and an entire nation to fight for it. And in the end, we still have rights that others don’t. 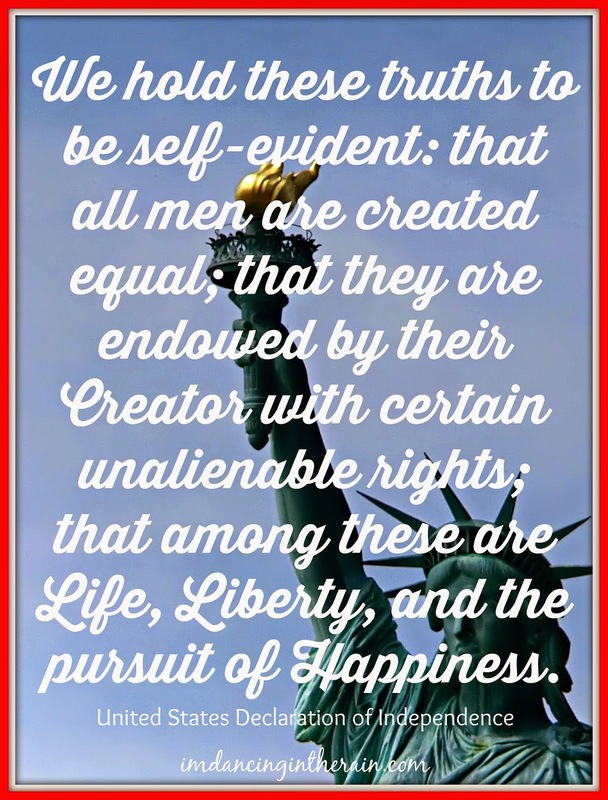 Rights that we consider birthrights, but that others in this world consider a privilege, and usually a privilege of those in charge or the wealthy ruling class. That’s a pretty phenomenal thing for us, as everyday citizens if you think about it. So maybe, just this once, just this year, forget all the squabbling on The Hill. Forget who messed up, who should have done this or that or whatever grievances you might have today, and just for one day, for the 4th of July, 2014, just be amazed at the nation you live in. Be all-inclusive in who gets to celebrate and be proud. Whether you choose to do fireworks or (like me) choose to admire from a far with a drink in your hand, it makes no difference. Regardless of how you celebrate the day our country declared itself free, take a chance to really celebrate what it means to be free, and remember how amazing The United States of America is. I am reminded that, for all her flaws, America is still pretty cool.